Snowgoons are back on the strength with their new full length album and wow, they’re bringing back the 90’s right in your eardrums with a vengeance. The album name’s „Goon Bap“, and it is a homage to the golden era of Hip Hop representing Boom Bap sound at it’s finest. Knowing for their numerous features, the Goons always bringing the top underground elite together for a gathering. So it“s only right to do it right, and with the dirty East Coast New York sound the Goons mange to place you in a time capsule for over 70 minutes, givin“ you a flashback of what you liked so much as you were a kid and teenager. Besides names like Method Man & Ghostface of the Wu Tang Clan, Dres from Blacksheep, Psycho Les from the Beatnuts, Onyx, M.O.P., Artifacts…. 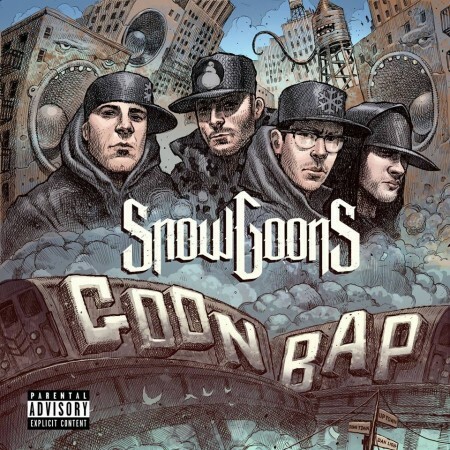 the Snowgoons also easily manage to place a whole bunch of extremely gifted young guns on the album, giving each and every of them an individually most suitable spot. Blowin up all scales right now, 18 year old wonderkid Token from Salem MA leads off a track called New Kidz On The Bloc. The song also features TJ Brown from Nas’s „The Get Down“ TV Show, Goon MuSick’s own Big Kurt, Wu Tang member U-God’s son Intell, and one of Canadas hottest rappers, Merkules. Another heavyhitter on the Goon Bap album is nobody else than Big Pun’s son Chris Rivers who is making a lot of noise on his own right now.